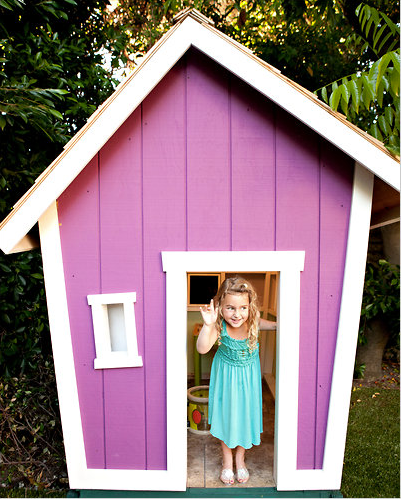 Ever since seeing this article in the New York Times a few months back, I’ve been obsessed with playhouses. With wallpaper, drapes and fridges, some of the pictures made me think that I was the one who needed a playhouse (I’d call it my design studio). But the playhouses I was most drawn to were kid-friendly and engaging. My friend Vigdis Burke fell in love with the Berkshires after a few family camp-outs in the Beartown State Forest. She and her husband bought a log cabin (close to the Butternut Ski Area) and wanted to enhance the native American spirit and oneness with nature that drew them there. Their 22-foot Tipi inspires family singing and chanting around the fire pit inside the tipi (available from Colorado Yurt Company). Kristjan, Frederick and Anika (below in one of her favorite Pink Chicken dresses) rule the land. Our friend Lee Hanson (chef at Minetta Tavern and Balthazar), escapes to the Northwest Woods of East Hampton with his family each weekend. Lee built a fairly simple structure using what he said was an excellent instruction book, Tree Houses You can Actually Build: A Weekend Project Book. It fits naturally into the woods and, made of cedar, it weathers nicely like the houses nearby. He outfitted the treehouse with a water balloon catapult and it is now Maya and Reid’s command center in raging water balloon battles against their parents. 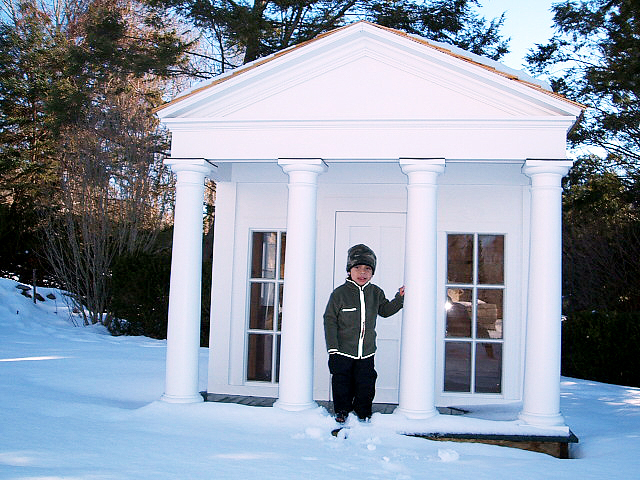 And our dear friend Keith Stout designed and built this mini Greek Revival for his son Eli. Perched along the Connecticut river, it fits in beautifully with the main house, gorgeous garden, and picture perfect setting. Eli stocks it with games and, in the summer months, hosts sleepovers in it. (And, like all parents, Keith now wonders where he found the time to accomplish this.) Keith replaced the glass in the antique windows with plexiglass so it wouldn't break. The interior of the house has changed as Elias has grown older. It used to have a wooden kitchen set inside where he would pretend to cook and then serve his fare picnic-style on the grass. Eli would also swing open the windows, turning his house into an instant ice cream shop. Now that Eli is nine years old, cots have been installed for sleepovers. Elias is currently campaigning for electricity. And still more of our friends have the good old tent set up in their backyards or city apartments, where along with a few flashlights and a snack or two, clubhouses are formed or pretend camp-outs take place. The theme remains the same; offer kids a little space and time to themselves and their imaginations will take off, (and aren't we all looking to carve out some tech-free time in our kids' lives?). 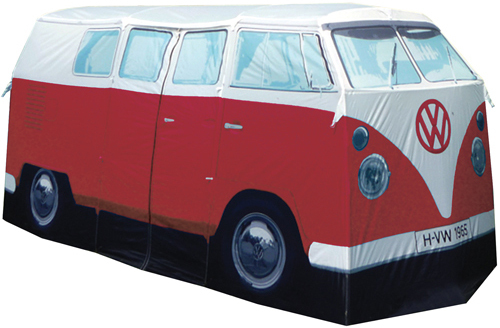 And then there’s this unbelievable VW bus tent. It’s time for a pretend trip cross country. I’m gonna let Belle and Sadie do the driving.